Cornwall - that's all there is to say! I am shamelessly starting my blog post this week with a picture of a Cornish cream tea because, in the space of seven days, I ate three... yes, three! I have no excuse except that I was on holiday and, when on holiday, any ideas of eating sensibly go out of the window. Isn't that what holidays are all about? I call it research. In the visitors' book, at the end of the stay, it's my duty to let future holidaymakers know which establishment has the fluffiest scones, the fruitiest jam and the stickiest clotted cream. It would be rude not to, wouldn't it? How I can get away with the two pasties, the clotted cream ice cream and the packet of Cornish fudge, which I also ate during the course of my visit, I've yet to work out. Seriously though, my holiday in the fishing village of Cadgwith Cove was a triumph. We stayed in a house on a hill looking over the bay and every morning we woke up to this view. I could quite happily have stayed in bed and just looked out at the sea, or read a book, or written a story... but then I would have missed out on so much: the clifftop walks, the fishing villages, the gardens... the chance of bumping into Poldark. Every day, we went on a long walk with Bonnie. Most of these walks were along the glorious South West Coastal path. The weather was perfect and we were amazed by the profusion of wildflowers that were growing on the cliff top and in the hedgerows. May is definitely the time to visit this beautiful county. It wasn't all about the walking though. Having not had a holiday in Cornwall since I was a child, and inspired by Poldark, I wanted to see as much of the area as possible. Cadgwith is on The Lizard and it was the perfect position to visit the many picturesque villages in the area: Mevagissey, Coverack, Lamorna. This is Mousehole. Pretty isn't it? During our week, we also visited two gardens: The Lost Gardens of Heligan and Trebah. It was difficult to choose our favourite. Because we had Bonnie, we couldn't visit the Eden Project but no visit to the west of Cornwall would be complete without going to the Minack theatre. What a place! It's astonishing how one woman could have created something so outstanding... and how can sea in England be that colour! We felt as though we were back on one of our Greek islands. We were very sad to leave at the end of the week. I'd like to say I got lots of writing done but I didn't. I didn't take a computer or even a notebook. I wanted to just soak up everything and enjoy it without having to think about how it could be translated into a story. Having said that, on my way home, unbidden, an idea popped into my head. Okay... it looks as though it's back to work for me. Have I ever mentioned that I love May? It's a month when flowers start to bloom in earnest, the woodlands are carpeted with bluebells and birdsong seems louder and sweeter. I also love May because it's the month of new beginnings for me. Thirteen years ago in May, my daughter (barely seventeen) gave birth to my first grandchild. Last week we celebrated his birthday. As he enters his teenage years, I marvel at what a fine young man he has become. Seven years ago in May, I married my lovely husband - another new beginning and another very special one. Five years ago in May, I wrote and sent off my first magazine story. A huge milestone. They didn't like that one... or the next two but the one after that was a hit. It was the beginning of my writing career. None of these three events could have been predicted but they all changed my life for the better. No wonder I love May. Today, I am delighted to welcome back to my blog, the talented author, Lynda Stacey. 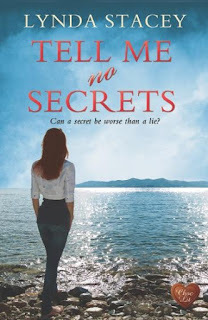 Her second novel, Tell Me No Secrets, was published by Choc Lit at the beginning of April and I wanted to find out a little more about her writing life and her new thriller. You’ve met me in the elevator. Can you convince me to buy Tell Me No Secrets before we reach the ground floor? 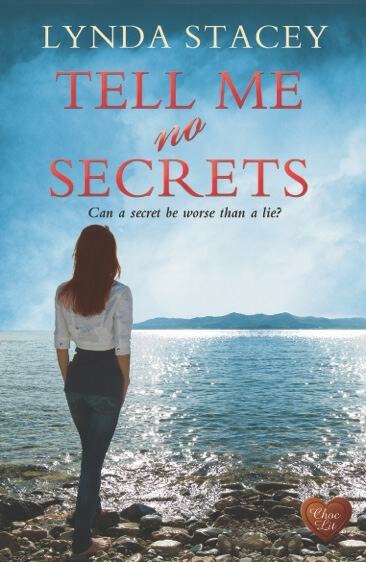 Tell Me No Secrets is a story of lies and deceit. Nothing is as it seems and you soon realise that the people closest to you are not always those you can trust. Nothing is as it seems, and in Kate Duggan’s case, the man she loves is the person she really should fear the most. Tell Me No Secrets is your second novel. Did you find it easier or harder to write than your first? Ha..ha… that’s a great question. But Tell Me No Secrets was actually the first novel I wrote. It had had a working title of Broken Jigsaw and in 2013 had been shortlisted for the Festival of Romance New Talent Award. It didn’t win, but being shortlisted gave me the confidence to keep going, to do all the re-writes, and the plot changes. All in all, it took around two years. As I said earlier, this was the first thing I’d ever written and if I’m perfectly honest it started out as a very different book, the original book was about child smuggling and Kate Duggan was the detective looking into it. However, it quickly became apparent that Kate Duggan as a character stood out and that it should be her story…. and so the re-writes began and the new plot emerged. When you write a character do you have an image of a real-life person in your head? Oh absolutely. I could literally go and knock on their doors and fully expect them to answer. The most difficult scene for me was where Rob attacked her. As a young 20-year-old, I’d personally suffered from domestic abuse, my first husband put me in hospital on more than one occasion and while writing the scene, I distinctly remember holding my breath and having to force myself to take on air. Sporadic… this is the only word that fits. I work full time as a Sales Director for a stationery and office supplies company. This means that my hours are long and can be stressful. It therefore depends on my frame of mind in the evenings as to whether I write or not. I tend to get the laptop on my knee and tap away while the hubby is watching television, much to his delight because that means he can slip the footy on while I’m not concentrating. How much research did you have to do for the novel? I spent time with a private investigator and with ex-drugs squad police officer and author, Michael Fowler. He gave me a lot of tips on how the vans would be used, what would be in them and what drugs would be bought and sold in this way. I also spent some time in Bedale, Whitby and at Richmond Castle, all of these places are scenes within the book. Of course at each of these locations I took my research seriously and had ‘fish and chips’ and a boat ride in Whitby, ‘Cream tea’ in Bedale and I tried the local ‘mead’ at Richmond castle. All in the name of research… of course!! Most definitely a pantster, my characters develop naturally, which means that I haven’t got a clue what they might do next. I know where I want my novel to begin, where it should end and who should fall in love with who, but other than that, I just work my way through it, scene by scene. I don’t plan anything, unless it’s a holiday of course and then I have a spread sheet for everything. What’s next for Lynda Stacey? I already have a contract with Choc Lit for Twisted Secrets, my 3rd Novel. And I’m currently writing a sequel for ‘House of Secrets’, which has a working title of ‘House of Christmas Secrets’. I wasn’t planning a sequel, but I keep getting asked for one, so I decided to give it a go. Thank you so much for visiting again, Lynda and I wish you lots of success with Tell Me No Secrets. She lives in a small rural hamlet near Doncaster, with her husband, Haydn, to whom she’s been happily married for over 20 years.